Short is good. When training Photon, we rarely go beyond 10 minutes at a stretch because she will always start getting muddled. And we always try to end on a positive, so if that means ending after six or seven minutes in after a particularly good response, so be it. Hi Duke! Hello Duke! I just found your site. 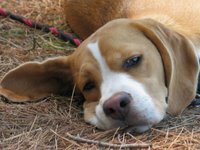 I hope your training is going well and that you are having a lot of fun with your dog :) Thank you for adding our video to your blog, that's really nice of you. Anyway - we just wanted to say hi, we'll visit your blog again. 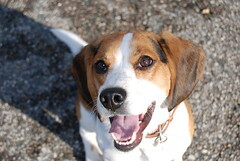 It's so nice to talk to other people who work with their dogs - splecially beagles! And wow a comment from Xsara's mom!! hello! We LOVE your videos. We wish we could meet Xsara. I'm sure Duke and her would get along great! !